Thus begins the description of the imaginary book that "inspired" this fragrance — a novel by imaginary author Farzan Al Essa that sounds like a captivating work of magical realism. 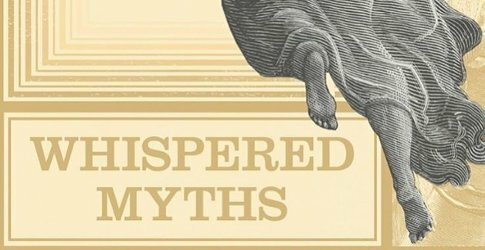 Whispered Myths was created by Josh Meyer, the perfumer behind Imaginary Authors, with notes of oud, cantaloupe, cedar, muskdana (also known as ambrette), honey and "salvaged shipwreck." Although that list of notes might not normally appeal to me, I was so taken by this fragrance's name, visuals and back-story that I wanted to try it regardless. I've spent most of my adult life studying art history and working in museums, and I'm perpetually fascinated by museum guards and their lives in (and beyond) museums. I've seen quite a few fragrances inspired by artists, but museum guards? Never. They're unsung heroes. So, what olfactory story does this fragrance tell? It definitely starts off with cantaloupe in its opening "lines." Is the melon motif included as a nod to the fictional hero's Middle Eastern ancestry? Only the imaginary author (or perfumer) knows for certain. The oud, another Middle Eastern theme, appears immediately after the melon. It's smoky and earthy. I don't know whether it comes from natural oud or synthetic ingredients, but it's bold and almost too intense (for me) at first. As the oud settles down, it turns more mellow. Whispered Myths' heart is a harmony of oud, traces of honey, and plenty of cedar. Is the cedar yet another nod to the novel's hero and his journey of self-discovery? A "quote" from the novel reads, “Lie with me. Lie to me. Saw through my center and count my rings" — so the tree/wood analogy works well here. Imagined Myths also turns more resin-y as it develops. In this phase it reminds me quite a bit of my favorite Diptyque holiday candles, which are usually the resin-themed, blue-packaged ones from the holiday trios. I must be smelling benzoin and perhaps some myrrh. This fragrance's projection went from above-average when I first applied it to average as it dried down, and its longevity was average. It's described as unisex, like all Imaginary Authors perfumes, but it does skews conventionally masculine in its earlier stages before it goes ,pre gender-neutral in its later heart and base. I enjoyed "listening" to Whispered Myths as it unfolded on my skin on a few chilly days this week. If you're a fan of earthy-woody scents with surprising plot twists, try to get hold of a sample and maybe even wear it to a museum. Imaginary Authors Whispered Myths is available in 14 ($48) or 50 ($120) ml Eau de Parfum. Samples are also available. For buying information, see the listing for Imaginary Authors under Perfume Houses. I’m so glad to see this reviewed, thank you! Cantaloupe is the note that put me off because I like the sound of everything else about this scent but sounds like maybe it doesn’t hold on all the way through. I like the Imaginary Authors line and always want to try whatever they release. I’m not a cantaloupe fan, either — so I was nervous when I applied this fragrance for the first time! I have to admit I was relieved when it faded out in a minute or so. It is!! I like their work, in general. This one isn’t as “me” as some of the others but I’ve really enjoyed wearing it several times. Always interested in IA fragrances I couldn’t really range this in my pattern, whether I would like it or not. Your review helps me a lot, thank you. Jessica, thank you for this perfect perfume review! Your writing mixes the ad copy and story of the fragrance with your experiences and how they color/bias your response. You describe the notes you detect and they way they rise (or elute) over time. Fun, fascinating read. It informs me that I probably *won’t* like this scent, but still makes me want to give it a try…and go to a museum. Be well! A former employee of the Met! Gosh, I’d love to get a gallery tour from you. It’s been years since I went to the Met (I don’t live in NYC anymore, or even on the east coast). I’m sorry to say I almost certainly wouldn’t like this scent. Those notes are shudder-inducing! But if I do come across a sample, I’ll try my best to wear it to an art museum and consider the inner lives of the guards.